Mamallapuram, also known as Mahabalipuram is an ancient historic seaport of Pallava Kings. An archaeological wonder and a UNESCO designated heritage site, Mammalapuram was a very important seaport during 7th century AD. Situated about 60 Km from the city of Chennai, Mammalapuram was once a bustling seaport where traders who traveled across to the ancient kingdoms of South Asia found ships to take them along with their wares. Many ships from the Far East too were frequently anchored here during 7th century AD to trade and barter goods. Built by the formidable Pallava Kings, Mammalapuram was named after one of the greatest Pallava Kings – Mammala Narasimhavarmar I (Mammala means ‘great warrior’) who ruled over the land around 7th Century AD. His father King Mahendravarmar I is credited with the fame of beginning the architectural work in the beaches of Mammalapuram and then they were continued by Narasimhavarmar. Some of the most famous monolithic structures were built during his reign – Pancha Rathas (Five Chariots), Descent of Ganga, rock-cut caves of Govardanadari, Mahishasuramardini, Jaya-Sayana Perumal Temple etc. During the 8th Century AD, King Rajasimha took on the mantle of building more structures in Mammalapuram. During this period, building structural temples were more popular than monolithic cut structures and it was during his period that the grand shore temple was built here. The Pallavas ruled over this region until the 9th Century AD and then the sun rose upon the Cholas. During the Cholas, Mammalapuram was used merely as a seaport and was later deserted. The dust settled upon the ancient temples for a long while until the monuments were rediscovered in the 19th century, antiquarian archaeologists. Weather is tropical in Mahabalipuram and the place enjoys more or less the same temperature as the City of Chennai does. The annual average temperature here is around 28 degrees and it can go as high as 42 degrees during the summer season. The best time to visit is from November to February when the temperature would be reasonably pleasant. The nearest airport is in Chennai which is about 55 Km from Mamallapuram. 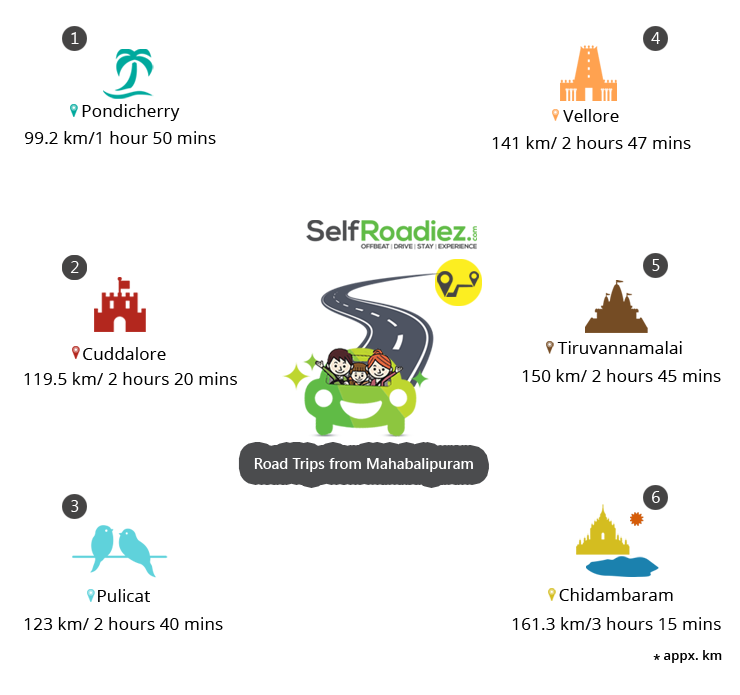 The nearest station is at Chengalpattu on Chennai’s suburban railway line around 30-35km away. One can’t really resist the lure of this quintessential French town with its legacy well preserved in the French quarter. One of the choicest holiday destinations, the beaches of Pondicherry offers a therapeutic allure to weary travelers. Popular beaches in this city would be – Promenade Beach, The Auroville Beach and the Serenity Beach. Mother’s ashram (also known as Aurobindo’s Ashram) draws tourists of all creeds and religion and one can experience true bliss and harmony while meditating before her tomb. Auroville is yet another magnet that draws people from all over the world. An experimental town situated 8 Km north is a universal self-sustainable town where men and women of varied nationalities live in peace and harmony. An ancient town, much like Mamallapuram, Cuddalore was under the reign of the Pallavas, medieval Cholas and later the Pandyas, Nayak Kings, Marathas, Tipu Sultan, French and the British Empire. There are many historical landmarks to visit in this ancient town. One of them is the Pataleeswarar temple, which was built during 7th Century AD whose greatness was sung by Hindu Saints Appar and Tirugnanasambandar. Those who love to relax by the beach must pay a visit to the Silver Beach. History lovers will find Fort St. David a very interesting place to visit. Owned by a Christian slave trader in 1653, Elihu Yale embezzled wealth and jewels through illegal profiteering against the East India Company, Yale invested the bulk of his fortune in the US and founded Yale University. Many wars have been fought for this fort and therefore it’s a scene of interest for history students today. Pulicat is yet another historical sea town in the Thiruvallur district. An active trading post of the Portuguese in the 16th century, the town was also ruled by the Dutch for a while, before being taken over by the British. The Pulicat Lake Bird Sanctuary is a popular destination for tourists as many species of migratory birds can be spotted here. Situated on the banks of Palar River, Vellore is a historical city that has been ruled by Pal Medieval Cholas, Pandyas, Vijayanagar Empire, Rashtrakutas, Carnatic Kingdom and the British. History aficionados must pay a visit to the Vellore Fort. Tipu Sultan and the last king of Sri Lanka Vikrama Rajasinha were held as royal prisoners in this Fort! The first rebellion against the British Raj erupted within the walls of this fort and it also witnessed the gory massacre of Vijayanagara Royal Family and its Emperor Sriranga Raya. Today, the fort has been declared as the Monument of National Importance and is a popular tourist attraction. Newly built Srilakshmi Golden Temple is yet another attraction that has tourists flocking towards it. Located in the foothills of Annamalai Hills, Tiruvannamalai is a temple town that ought to be visited at least once in your lifetime. Mystics believe that the sacred Annamalai hill is the physical manifestation of Lord Shiva’s lingam in this world. The Annamalayar Temple is generally believed to have been built during the 9th Century AD and there are inscriptions that date back to Cholas and Pandyas as patrons of this temple. The ashram of Ramana Maharishi is a popular attraction that draws devotees from all over India and the world. Find suggestions to plan this Spiritual Holiday at Tiruvannamalai. An ancient temple town, Chidambaram has been under the rule of various kings since antiquity. Right from medieval Cholas, Pandyas, Vijayanagara Empire, Marathas and then the British. One of the most popular destinations in this town is the Thillai Nataraja Temple. Believed to have been built during the 7th century AD, the presiding deity of Lord Shiva in this temple is in his cosmic dance form which this temple a very important shrine for Saivite devotees. Sightseeing in Mamallapuram is an experience to be savored. The graceful beauty of the art and architecture of the stone reliefs, cave temples, and monolithic structures transports one to the era of great Pallavas. One can admire the intricate architecture of the Shore Temple, Five Rathas (Five Chariots of Pandavas), Arjuna’s Penance, Krishna’s Butterball, Mahishamardini’s cave, Varaha Cave and the ancient lighthouse that used to warn the ships to stay away from the shallow coast. Mamallapuram is a tourist’s paradise where one can find accommodation in the finest hotels and resorts that a hospitality industry can offer. At the same time, it also caters to budget travelers offering hotels with reasonable rates. There are also many pleasant homestays along the East Coast Road that offers clean accommodation with beach-view rooms. Mamallapuram still has many secrets that are yet to be unraveled. During the 2004 Tsunami when the water withdrew, many were able to spot temples and structures well into the sea that have not been excavated yet. Today, many archaeologists are working at the site to uncover these structures. 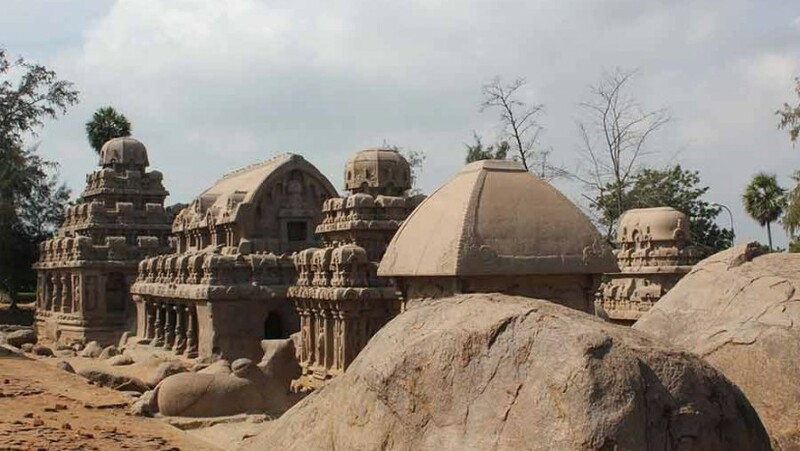 Mahabalipuram holds heritage in huge measure and is an important part of India’s ancient history. Travelers looking to explore the eastern coast shouldn’t miss this tiny slice of a temple town.